KING PÉPE & HIS CALYPSO COMBO not only are inspired by the Latin American and Afro-Caribbean music, they revisit it. They take us to distant lands in the middle of the 30s, 40s, and 50s, combining Caribbean rhythms with Latin and New Orleans jazz; it is a journey through time, from Trinidad to Jamaica, the Bahamas, Cuba and Colombia until Brazil, and up through the banks of the Mississippi. It’s the grace and beauty of Calypso and Mento mixed with Goombay, Highlife, Mambo, Son Cubano, Changui, Samba, Cumbia, Merengue, Jazz, Blues, Rhythm & Blues, and Oldies – a tasty musical stew indeed. This hard working French combo is a perfect fit for our “78RPM style 10” LP calypso series. It has the look and feel of those original Jamaican Mento albums, recorded in 33 rpm (don’t worry!). Antique olive green vinyl. 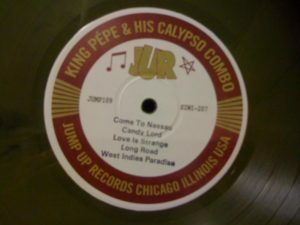 Limited edition on JUMP UP Records. For Fans of: Blake Alphonso Higgs, Sidney Bean, Count Lasher, Andre Toussaint, Tanamo Lord, Lord Kitchener, King Sparrow, The Roaring Lion, Lloyd Thomas Prince, Carl MacCleverty, Bill Fleming, Los Compadres, Billie Holiday, Lester Young, Ernest Ranglin. THE CALYPSO SERIES looks great next to our authentic Rhumba Box! Previous post: LOWER International Shipping through FIMS: Fed Ex International Mail Service! 3 LPs for $20 postage!